When it comes to our sense of well-being, our home is central to how we feel. Our environment has a huge impact on our mental health, however, a lot of people ignore the link between a healthy home and a happy mind. As its world mental health awareness day, we thought now would be the perfect time to share our top tips for decorating your home in a way that helps your mental health flourish. By following these steps you’ll be able to create a space you love, that encourages you to keep calm and feel happier at home. Chances are, you’ve probably heard your parents say this a fair few times. It seems obvious and pretty boring but there’s nothing more cleansing for the mind than a quick tidy. If your environment is messy and chaotic, it’s only going to add to any stress you’re currently feeling. So, pick up those clothes, put away the dishes and have a quick hoover. We guarantee you’ll feel better for it! Increasing your exposure to sunlight may be the most effective and simple way to give your mood a makeover. Those sun rays bring some vital vitamin D into our lives and they also increase the production of serotonin and endorphins (our body’s feel-good chemicals). 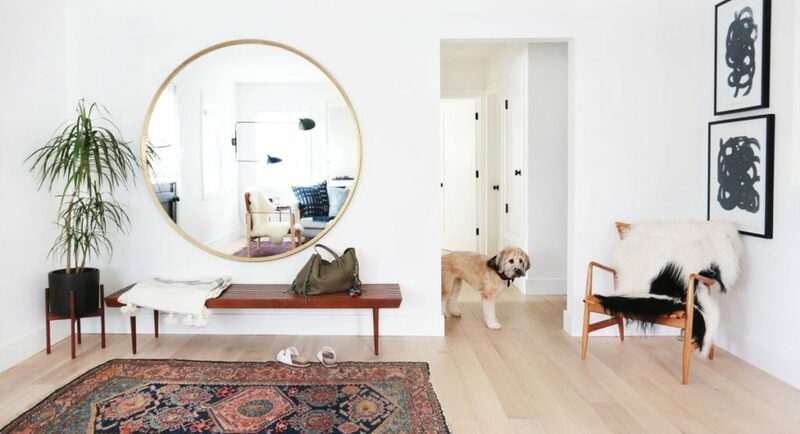 Make the most of the light you do have by adding large mirrors to your room which will help reflect light around the space. Alternatively, you can add shiny homeware items to your room like a mirrored table to help reflect light. If you’re really committed to increasing your homes natural light you can paint your walls a lighter colour or even add larger windows. Getting creative with colour at home can be a fun and a fairly cheap way to refresh your state of mind. Colour preference varies from person to person and can really impact how you feel – so make sure you do your research before you start painting. 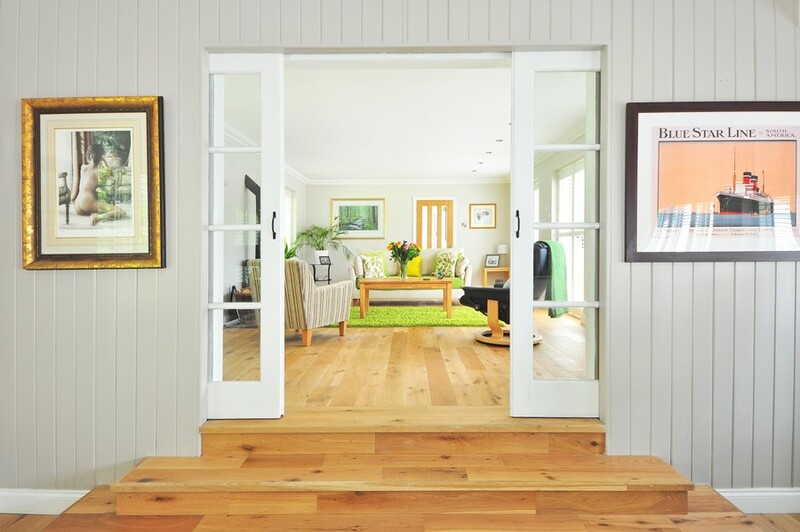 Get clued up on the colours that make you feel happy and peaceful, then apply it to the spaces in your house. If you don’t want to take the plunge and paint your living room bright blue, why not experiment with soft furnishings. You can start off by choosing bedding, furniture or decorative pillows in your favourite shade which should put a smile on your face. 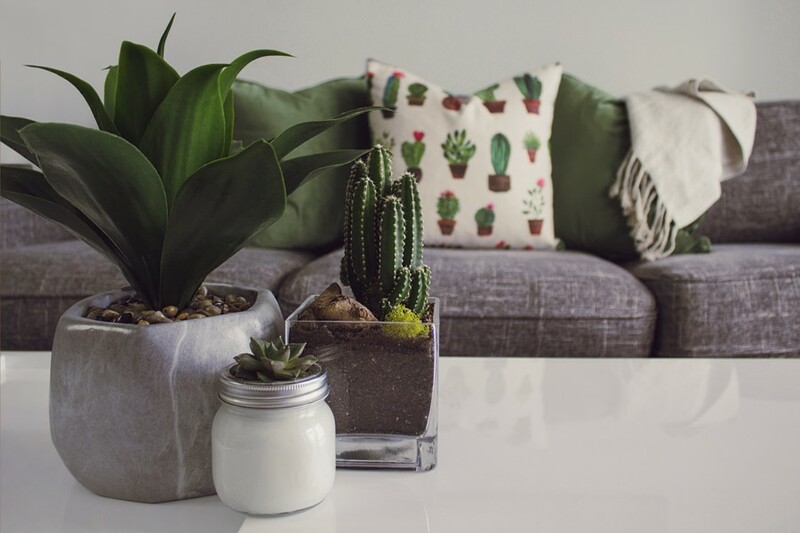 Having plants in your home have been proven to improve your mood, help productivity levels and reduce stress. Fresh flowers are perfect for adding a splash of extra colour and a nice scent to any living space. If fresh flowers aren’t really your thing, a houseplant would be the perfect addition. Whether that’s in the form of potted herbs for the kitchen or a simple succulent for the living room, it’s completely up to you. Get yourself some indoor foliage and reap the calming and productive benefits. Good mood lighting is the perfect way to make any space feel warm and cosy. At the end of a long day, it’s important to create a calm environment in which you can unwind and decompress. Wave goodbye to bright ceiling lights and welcome low-level lighting alternatives into your home. Fill your house with lamps, floor lights, fairy lights, and candles – all of which will help to create a cosy atmosphere. Minimising electronics from the bedroom can aid restful sleep which is essential for a happy, healthy mindset. If you have a television in the bedroom try and trade it for a book stand and fill it with your favourite reads. This will eliminate the temptation to turn on the TV before bed and will encourage you to engage in a more productive bedtime ritual.